This is a great opportunity to visit this country of legends for gods and heroes, to see the Valley of Roses, to smell the rose oil perfume and get acquainted with 5 civilizations, which are the foundation of modern European culture, Thracian, Ancient Greek, Roman and Bulgarian civilizations. Dinner in a folklore restaurant (optional 16 euro/pp 3 course menu without beverages). There you will not only try the typical Bulgarian dishes, but will listen to Bulgarian folk music and hectic rhythms of the dynamic Bulgarian folk dances.Overnight. Breakfast. Time for shopping , visiting and leisure or optional one day excursion to Rila Monastery and the Boyana Church ( 25 euro/pp in summer and 35 euro/pp in winter ). Rila Monastery is one of the most impressive UNESCO world heritage sites in Bulgaria and it is the largest Eastern orthodox monastery in Bulgaria. It is situated 117 km (73 mi) south of the capital Sofia. Founded in the 10th century, the Rila Monastery is regarded as one of Bulgaria's most important cultural, historical and architectural monuments and is a key tourist attraction for both Bulgaria and Southern Europe. 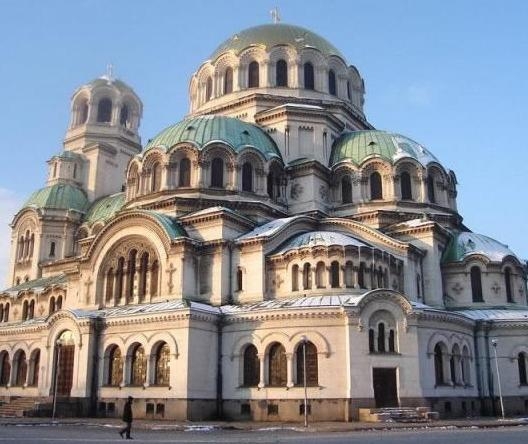 The whole complex occupies an area of 8,800 m² and is rectangular in form, centered around the inner yard, where the tower and the main church are situated.Return to Sofia. Visit the Boyana Church, located on the outskirts of Sofia. It is a true masterpiece of the Bulgarian Middle Agesand the avant-garde of the European Renaissance. Its frescoes dates from 1259 year and it was declared by UNESCO a World Cultural Heritage. Overnight. Breakfast. Departure to Veliko Tarnovo - the former Bulgarian capital. Accommodation in a 4* hotel - hotel . This is a beautiful city built on hills at the foot of which the Yantra River is winding. This is the city chosen by the Second Bulgarian kingdom for its capital (12th - 14th century). Tsarevets Hill, home to the Royal Palace and Patriarchy. Visit the street of the crafts - Samovodska charshija where crafts studios are still active. There is immersive atmosphere of 60th-70th years of the 19th century. Overnight. Breakfast. Departure to The Architectural And Ethnographic Complex Etar. It is situated on the outskirts of the town of Gabrovo. It is an open air museum. The purpose of which is to present the architecture and the style of life in Gabrovo and the region during the second half of the 18th century and the beginning of the 19th century. 16 houses can be seen on the crafts bazaar (the central commercial street) in the Etar, which are exact copies of buildings existing in the past in Gabrovo and the region. On the crafts street the visitors can watch in real time the work of the craftsmen. Departure to the Valley of the Kings and the Valley of the Roses. There is a big number of also the Thracian tombs. One of the most interesting is”Goliamata Kosmatka”. Archaeologists reveal it several years ago. It was buried the Thraciann King Seuthes III. This monument of the Thracian civilization is 2500 years (5th century BC). There are questions about its construction, which still awaits an answer. The Rosa Damascena, known as the Damask or Castile rose, is the greatest treasure in the region of Kazanlak and it is one of the nation’s symbols. Under the influence of the country’s unique climate and soil, this rose gradually developed into a Bulgarian strain distinct from Damask roses elsewhere. That is why at the beginning of the 19th century this rose was named the Kazanlak Damask rose and the valley to the south of the Central Balkans came to be known as the Valley of the Roses. Here is produced 80% of the world production of rose oil, which is in the base of the highest quality perfumes. For centuries, roses have been the basis for the livelihood of this region. More can be learned about the region’s rose cultivation at the Kulata Ethnographic Complex. Here visitors can arrange in advance to observe the practice of traditional local customs and sample food and drink made from Kazanlak roses. Ethnographic Complex “Tower” welcomes guests with a sweet from roses and rose liqueur and it is not rare. Visit Thracian Tomb of Kazanlak (fourth century BC). Unknown artist of old times used 4 main colors and 2 - painting techniques. This tomb is included in UNESCO World Heritage Site. Departure to Plovdiv - the second largest city in Bulgaria. Accommodation in 4*hotel. Overnight. Breakfast. Walking tour of the city. Plovdiv is one of the oldest cities in Europe. It was founded before Athens, Rome and Constantinople in the time at which was based and the ancient city of Troy. There are artifacts of Thracian civilization. The Thracians were famous in the ancient world for its wines, which were declared as the best. The period during which Plovdiv has been within the Roman Empire was marked by the construction of many large public buildings like an amphitheater (late first and early second century of our era). And nowadays it is used for performances and outdoor concerts. Other major monuments of Roman civilization are the Roman Forum (2nd century BC) and Roman stadium in length of 180 meters and with 30,000 seats (second century of our era). At that time the name of the city was Trimontium, which means "town on three hills." Departure to Panagurishte. Visit of the historical museum with the famous Panagurishte gold treasure 2400 years old ( dated end of the 4-th beginning of the 3-d century BC ). It is a masterpiece of the Antiquity . The treasure consists of nine vessels made of pure 24- karat gold, with total weight of 6.164 kg . Viewing of the house-museum "Raina Knyagina", Dudekov house, Tutev house, Lekova house and historical monuments in the city that has experienced its star moment during the April Uprising, when he was declared the capital of Bulgaria. Wine tasting in the wine cellar Rumelia. Overnight. Breakfst. Departure to to Sofia airport.